During the engine experimental investigation usually was obtained engine effective power and rotational speed. In order to obtain engine mechanical efficiency and engine indicated power from experimental data, must be used equation for calculation of engine mean pressure of mechanical losses along with its proper coefficients. This equation gives correct values if engine mechanical efficiency and engine indicated power was obtained in the range ±1.5%, when compared with experimentally obtained ones. For marine slow speed twostroke diesel engine 6S50MC MAN B&W was analyzed this equation along with its coefficients during the whole range of engine loads. The mean pressure of mechanical losses equation, when obtained coefficients was applied, gives a percentage difference in the range ±0.79% for the engine mechanical efficiency and percentage difference in the range ±0.85% for the engine indicated power when compared with experimentally obtained values. For the higher engine loads presented equation is even more accurate and precise. 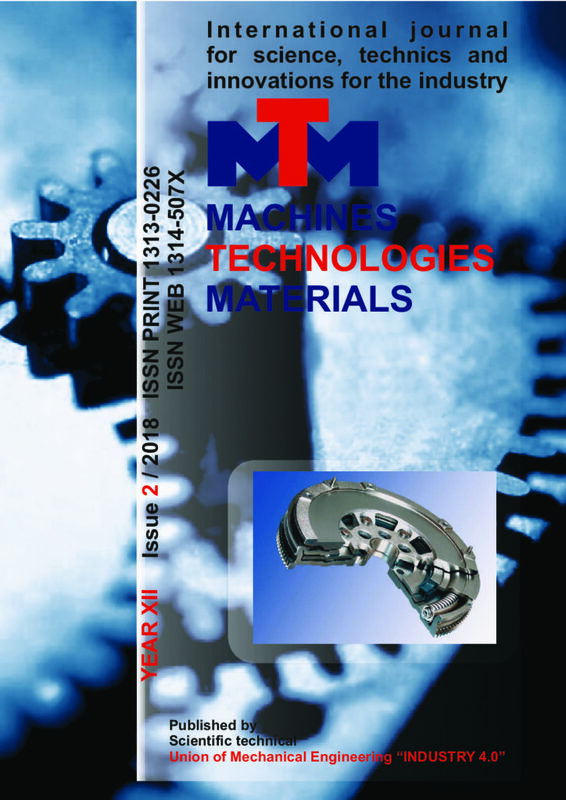 This paper describes the results of numerical simulations of a vehicle drivetrain model with dual mass flywheel. The differential equations of the model are given. The vehicle inertia, the tire torsional stiffness and the transmission gear ratios are taking into account. Numerical simulations with given mass, elastic and damping parameters are carried out. Natural frequencies of the system are determinate. Vibrational characteristics of the system are shown and analysed. Some initial information is given for the competent design of household LED lighting fixtures. MICROSTRUCTURAL EVOLUTION AND MECHANICAL PROPERTIES OF ALUMINUM IN THE PROCESS "PRESSING-DRAWING"
The aim of this work is to study the influence of the combined process of "pressing-drawing" on the microstructure and mechanical properties of aluminium wire. Analysis of the results of the research has shown that the proposed combined method of deformation "pressing-drawing" has a significant advantage over the existing technology of production of aluminium wire. This method of deformation due to combination of two ways: by severe plastic deformation in equal channel step die and the process of drawing through a drawing die, allows obtaining aluminium wire with ultrafine-grained structure and a high level of mechanical properties, required size and shape of the cross section at a small number of cycles of deformation. Also would like to mention that this method of deformation in implementing it in production does not require significant economic investments, and substantial refitting of existing drawing mills. Serial resonant bridge converter commonly used in process of induction heating on metal materials. In these applications during the heating process, the converter load equivalent electrical parameters are changed. This contributes to the transferred power from the converter to the induction device to change. In this paper with mathematical analysis are determined the quantities from which depends the active power of the resonant converter. Derived is an equation that gives the dependence of the active power from the phase angle between the voltage and current the converter as and from the duty cycle. This equation can be used in control methods to maintain maximum convertor power transfer. The poor technical condition of the existing irrigation infrastructure in our country and “Common Strategy for Management and Development of Hydro melioration and Protection against Harmful Effects of Water”, which was prepared by a World Bank, give us reason to expect the financing of projects for the rehabilitation and modernization of irrigation systems. Analyzed good practice in this area shows that project management is essential to the qualitative and effective achievement of the main goal. In the report, special attention has been paid to the process of planning certain priority projects for the rehabilitation and reconstruction of irrigation infrastructure at the construction stage and an analysis has been carried out for the different areas of management (time, costs, quality, human resources, communications, supplies and risks). The inadequate economic policy in 90’s brings to destruction of basic sectors of the Bulgarian industry. Bulgaria is one of European’s countries mostly engaged with deindustrialization process. Nowadays we have to pay more attention to high technological sectors in industry which are based upon theoretical and practical knowledge that by its side is based of enormous investments in science. The condition of Bulgarian industry needs to focus urgently towards inculcating innovations and investments for increasing the enterprise competitiveness. The introducing innovations needs special attention nowadays because the rapidly speed of changes. The world had gone through the industrial time to the age of knowledge. In the fast developing global environment the strategic advantage can be brought by leaders of changes and the only way for that is by introducing innovations. An important role for the long term competitiveness of the Bulgarian economy has the increasing level of innovative enterprises which produce and inculcate new products and processes and the participation of the country in the global high technological manufacture. The reviving of the Bulgarian industry is connected with building new high-tech enterprises and a good example for that is Trakia economic zone (Plovdiv region, Bulgaria). The paper analyzes melt shop and caster scheduling at special steel maker – Trinecke Zelezarny. The main optimization objectives of melt shop and caster scheduling are defined as: minimization of earliness and lateness of orders, maximization of tundish utilization, minimization of steel grade changes and minimization of mold width changes, minimization of stock, minimization of over grading, management of iron inventory. The following key problems of scheduling are defined: underdeveloped optimization algorithms and insufficient computer performance. Based on this the key provisions of a new method of melt shop and caster scheduling are proposed. The method significantly improves quality of planning. It includes the following three stages: production capacity allocation; heat building; sequencing. An experience of successful practical development and implementation of specialized software solution based on the new method at Czech special steel maker is provided. This paper considers the process electron beam welding of stainless steel type 1H18NT in vacuum. Based on experimental data, the influence of the variations of the following process parameters: electron beam power, welding velocity, the distances from the magnetic lens of the electron gun to the beam focus and to the surface of the treated sample is investigated. Neural and regression models for the geometry characteristics of the welded joints: surface of the weld cross-sections, weld depths and mean weld widths of the samples are estimated, as well as models for defining the areas of the process parameters, where the appearance of defects is or is not expected. The obtained models are used for developing the graphical user interface aiming investigation and prediction of the electron beam welding characteristics and process parameter optimization. This software can be implemented for supporting the operator’s choice of appropriate work regimes, obtaining the required welds quality standards, for education and investigations. Using computer modelling with originally developed semi empirical physical grounded models study of structure formation when austenite transformation during cooling by certain regime in eutectoid steel was carried out. The model allowed us to predict final structure. Cooling curves leading to fine pearlite (almost without bainite) and lower bainite (with a small part of fine pearlite) structures were find out. The results obtained could be useful for high carbon ordinary instrumental and constructional steels with higher manganese production and processing (rails, cord and rope wire, springs, low stressed instruments). Realization of the fine pearlite obtaining regime needs equipment that could provide cooling rates from 0.04 deg./sec. to 6.6 deg./sec. with average value of 1.1 deg./sec.. For bainitic structure obtaining the range of cooling rates provided shoud be from 0.14 deg./sec. to 14.0 deg./sec. with average value of 2.2 deg./sec. The cooling intensivity must have an ability to arbitrary and controlled changing during process. The impact of the parameters of thermomechanical treatment on the structural changes and micro-hardness of low- and medium carbon steels under a high hydrostatic pressure at high pressure torsion (HPT) is investigated. It is established that for HPT the deformation temperature has a decisive impact on the efficiency of refinement and hardening. This is caused by the effect of dynamic strain ageing (DSA) at 250 and 400оС during HPT. At the same time the level of accumulated strain in the sample intensifies the refinement under the effect of dynamic strain ageing (DSA). It should be noted that an increase of the carbon content to 0.2 % and 0.45% in steel leads to an increase in the temperature of dynamic strain ageing (DSA) to 400оС. It is stated that HPT under the effect of dynamic strain ageing (DSA) results in the formation of a gradient structure in the samples after five rotations of the anvil (емах=6.26) at a hydrostatic pressure of 6 GPa. The possibility of control of efficiency of different factors of high voltage electric discharge (HVED) impact on Ti – Al – С powders system for aimed synthesis of dispersion-hardening components is shown. Nanolaminate-composite Ti3AlC2 – TiC with hardness of HV5 = 7 GPa, obtained by consolidation of blend of 85 % Ti + 15 % Al initial composition after HVED with the use of multi-point electrode system has needle structure of Ti3AlC2 (a = 0.3068 nm, c = 1.844 nm) with size up to 10 μm, and TiC dispersion-hardening phase (a = c = 4.4331 nm) with particle size no more than 1 μm is situated between grains of Ti3AlC2. Dynamic strength of specimens depending on electrode system used during HVED treatment of blend variated in range from 160 to 620 MPa, Young modulus – from 13 to 22 GPa at deformation rate from 600 to 900 s–1. Material has high levels of heat resistance, relative change of mass is no more, than 0.001.